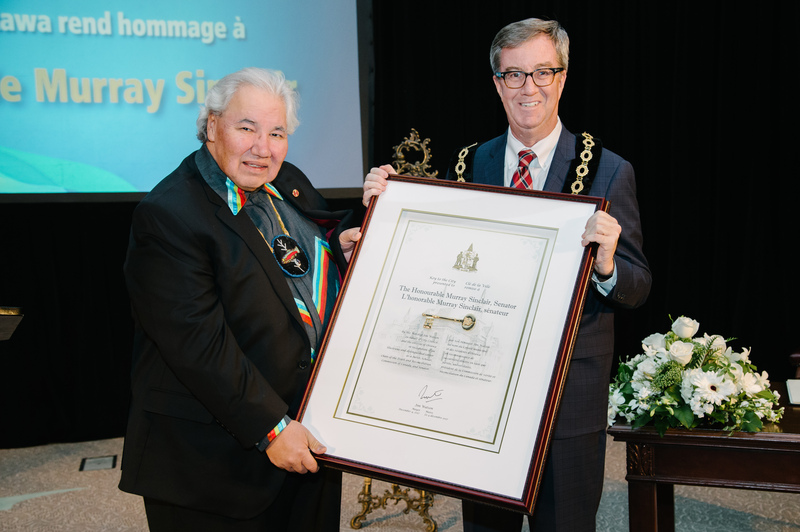 Ottawa – This evening, Mayor Jim Watson presented the Key to the City to the Honourable Murray Sinclair, Senator, at a ceremony at City Hall. The key was presented to Senator Sinclair in recognition of his illustrious and distinguished career as a Jurist, Scholar, Chief Commissioner of the Truth and Reconciliation Commission of Canada, and Senator. Senator Sinclair, appointed to the Senate in 2016, was Manitoba’s first Aboriginal Judge and Canada’s second. He is known for his representation of Aboriginal people and his knowledge of Aboriginal legal issues. Senator Sinclair led the Truth and Reconciliation Commission of Canada which studied the abuse of aboriginal children and youth at Indian Residential Schools. Its mandate is to inform all Canadians about what happened in Indian Residential Schools. An ornamental key is presented to esteemed residents, visitors and others whom the City of Ottawa wishes to honour. This practice has a symbolic meaning evoking medieval walled cities, the gates of which would be guarded during the day and locked at night. The key symbolizes the freedom of the recipient to enter and leave the city at will as a trusted friend of city residents. The Honourable Murray Sinclair, Senator, served the justice system of Manitoba for over 25 years and was appointed Associate Chief Judge of the Provincial Court of Manitoba in March of 1988 and to the Court of Queen’s Bench of Manitoba in January 2001. He was Manitoba’s first Aboriginal Judge and Canada’s second. Murray Sinclair served as Co-Chair of the Aboriginal Justice Inquiry in Manitoba and as Chief Commissioner of the Truth and Reconciliation Commission of Canada (TRC). He participated in hundreds of hearings across Canada, culminating in the issuance of the TRC’s report in 2015. He also oversaw an active multi-million-dollar fundraising program to support various TRC events and activities, and to allow survivors to travel to attend TRC events. Senator Sinclair has been invited to speak throughout Canada, the United States and internationally, including the Cambridge Lectures. He has been recognized with numerous awards including the National Aboriginal Achievement Award, the Manitoba Bar Association’s Equality Award (2001) and its Distinguished Service Award (2016) and has received Honorary Doctorates from 10 Canadian universities. The Honourable Murray Sinclair was appointed to the Senate of Canada on April 2, 2016.